Elizabeth P. Harvey was born circa 1799 at Granville, Hampden Co., MA.2 She was the daughter of Dr. Rufus Harvey and Cynthia Bucklin. Elizabeth P. Harvey married Rev. Orlin Parsons Hayes, son of Levi Hayes and Ruhamah Parsons. 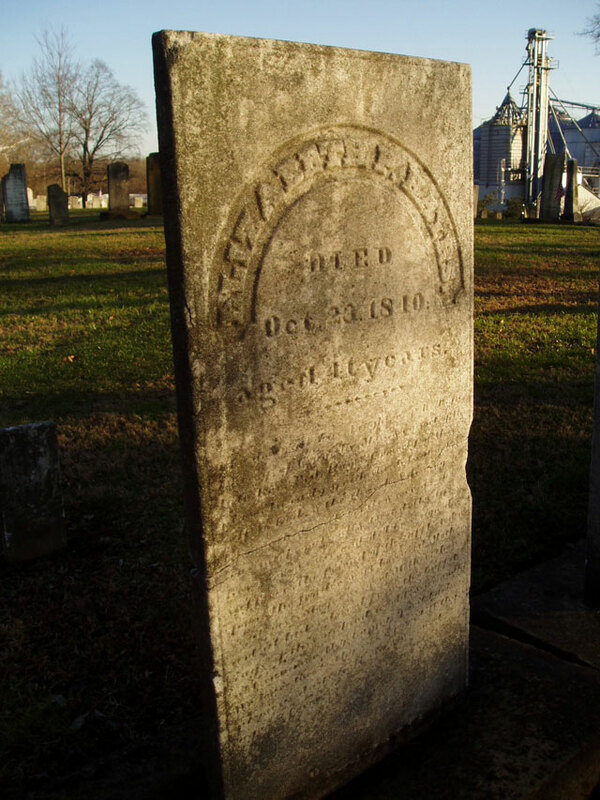 Elizabeth P. Harvey died on 23 October 1840 at Granville, Licking Co., OH.2 She was buried at Old Colony Cemetery, Granville, Licking Co., OH. [S104] DAR DAR Lineage book, Vol. 10:Pg. 333/Item 9937. Dr. Rufus Harvey was the son of Josiah Harvey and Elizabeth Bates. Cynthia Ann Hayes was the daughter of Rev. Orlin Parsons Hayes and Elizabeth P. Harvey. Cynthia Ann Hayes lived in 1883 at near Boston, MA. [S25] Hannah McPherson, Holcombe Genealogy, Page 154.1/Item A-8-1-6-1-6-2-1. Florilla M. Hutchins was born at FL. Flora died shortly after her marriage. She was the daughter of Capt. George W. Hutchins and Cynthia Ann Hayes. [S25] Hannah McPherson, Holcombe Genealogy, Page 154.1/Item A-8-1-6-1-6-2-1-1. Rosa Hutchins was the daughter of Capt. George W. Hutchins and Cynthia Ann Hayes. Mary Hutchins was the son of Capt. George W. Hutchins and Cynthia Ann Hayes. Son Hutchins was the son of Capt. George W. Hutchins and Cynthia Ann Hayes. Josiah Harvey, 1776, entered the service as a surgeon's mate in Col. John Fellow's regiment. It seems strange that Diodorus would leave NY for Saginaw MI, where his last three children were born, and then all of the children return to NY. The census records indicate that son Benjamin was born in NY. Diodorus and Samantha were enumerated in the 1870, Plattsburgh, Clinton Co., NY, federal census. He was a retired Hotel Proprietor, age 68., she was 57, both born in VT. Children in the household were Dan 19, Rush 29, and Helen 21 (wife of Rush apparently.) Diodorus Sicculus Holcombe was born on 25 August 1800. He was the son of Diodorus Holcombe and Sybil Spaulding. Diodorus Sicculus Holcombe married Roxy Cole, daughter of (?) Cole, on 20 October 1825. Diodorus Sicculus Holcombe married Maria S. Cole, daughter of (?) Cole. [S25] Hannah McPherson, Holcombe Genealogy, Page 198.2/Item A-8-3-4-1-1-3-1. Rebecca Holcombe was born on 3 March 1802. She was the daughter of Diodorus Holcombe and Sybil Spaulding. Rebecca Holcombe lived at MI. [S25] Hannah McPherson, Holcombe Genealogy, Page 199.1/Item A-8-3-4-1-1-3-2. Lucinda Holcombe was born on 21 October 1805. She was the daughter of Diodorus Holcombe and Sybil Spaulding. Horace Holcombe was born on 21 May 1807. He was the son of Diodorus Holcombe and Sybil Spaulding. Horace Holcombe died on 8 December 1860 at age 53. Horace was trustee of the 1st Baptist Church, Milltown, Essex Co., (formerly Clinton), NY. [S25] Hannah McPherson, Holcombe Genealogy, Page 199.1/Item A-8-3-4-1-1-3-5. Maria Holcombe was born on 2 June 1809. She was the daughter of Diodorus Holcombe and Sybil Spaulding. [S25] Hannah McPherson, Holcombe Genealogy, Page 199.1/Item A-8-3-4-1-1-3-6. Minerva Eliza Holcombe was born on 2 June 1809. She was the daughter of Diodorus Holcombe and Sybil Spaulding. Minerva Eliza Holcombe married William Jonas Cutting, son of Sewell Cutting and Mary Hunter. Minerva Eliza Holcombe died Feburary 15, 1866. [S25] Hannah McPherson, Holcombe Genealogy, Page 199.1/Item A-8-3-4-1-1-3-7. [S104] DAR DAR Lineage book, Vol. 28:Pg. 153/Item 27415. William D. Holcombe was born in January 1814. He was the son of Diodorus Holcombe and Sylvia Loveland. William D. Holcombe married Persis Swift Everest, daughter of Hiram Everest and Mary Ann Swift, on 24 May 1841 at Moriah, NY.2 William D. Holcombe died in 1859 at Galesburg, Knox Co., IL. W.D. and Persus were recorded in the 1850 Westport, Essex Co., NY, federal census. He wasa tailor 25, she was 28. The only child in hte household was Clara, 4. [S25] Hannah McPherson, Holcombe Genealogy, Page 199.1/Item A-8-3-4-1-1-3-8. [S652] Hubert M. Sedgwick, Sedgwick Genealogy, page 308. Henry H. Holcombe was born on 13 October 1816. He was the son of Diodorus Holcombe and Sylvia Loveland. Henry H. Holcombe married Aurelia Ferris on 20 January 1845. Henry is recorded in the 1850 census of Westport, Essex Co., NY as farmer. [S25] Hannah McPherson, Holcombe Genealogy, Page 199.1/Item A-8-3-4-1-1-3-9. Benjamin F. Holcombe was born in 1821. He was the son of Diodorus Holcombe and Sylvia Loveland. [S25] Hannah McPherson, Holcombe Genealogy, Page 199.2/Item A-8-3-4-1-1-3-10. Sylvester was a physician at Joy, Essex Co., NY. Sylvester H. Holcombe was born in 1825. He was the son of Diodorus Holcombe and Sylvia Loveland. [S25] Hannah McPherson, Holcombe Genealogy, Page 199.2/Item A-8-3-4-1-1-3-12. Thomas is recorded in the 1850 census of Poultney, rutland Co., VT as a student in a seminary there, over 18 years old; graduated Knox College, 1855; appointed Us Consul to Sweden by President Cleveland; moved from Cobden, Union Co., IL to Ocean springs, Jackson Co., Miss; was prosperous. In his will, probated at Pascagoula, Miss., his widow was sole legatee. They had no children, but reared seveal foster sons. Of these, Theodore Bechtel took most of Martha's property as residuary legatee. Thomas Addis Emmett Holcombe was born on 9 April 1831. He was the son of Diodorus Holcombe and Sylvia Loveland. Thomas Addis Emmett Holcombe married Martha A. Lyon on 10 March 1857. Thomas Addis Emmett Holcombe died in 1897 at Ocean Springs, MS.
[S25] Hannah McPherson, Holcombe Genealogy, Page 199.2/Item A-8-3-4-1-1-3-13. Charles W. Holcombe was born in May 1833. He was the son of Diodorus Holcombe and Sylvia Loveland. There seems to be some confusion about Huldah and whether she was the daughter of Diodorus or his granddaughter by Amos Bull. The DAR records indicate that Huldah is the daughter of Amos and I would think that Eva Bartlet would know who her parents and grandparents were. So we will continue Huldah and her husband, Orson Bartlett, under Amos. Huldah Holcombe was born in 1834. She was the daughter of Diodorus Holcombe and Sylvia Loveland. [S25] Hannah McPherson, Holcombe Genealogy, Page 199.2/Item A-8-3-4-1-1-3-15. Jonathan Clark Brown was the son of Josiah Brown and Mary Kingsbury. Josiah served as a sergeant in Capt. Solomon willis's company of Tolland county. Josiah Brown was born in 1758 at Ipswich, MA. He died in 1832 at Coventry, Tolland Co., CT.
Dr. Stephen Cole was the son of Daniel Cole and Edith Wilbur. Dr. Stephen Cole married Joanna Holbrook, daughter of John Holbrook and Sybil Lane, in 1811. [S104] DAR DAR Lineage book, Vol. 31:Pg. 259/Item 30748. Joanna Holbrook was the daughter of John Holbrook and Sybil Lane. Joanna Holbrook married Dr. Stephen Cole, son of Daniel Cole and Edith Wilbur, in 1811. Daniel was placed on the pension roll of Sullivan Co., NH for service as private and sergeant in the Connecticut Continental line. Daniel Cole was born in 1758 at Plainfield, CT. He was the son of Ebenezer Cole and Elizabeth Wheeler. Daniel Cole married Edith Wilbur, daughter of Aaron Wilbur and Mary Church, in 1783. Daniel Cole died in 1842 at Plainfield, NH. Edith Wilbur was the daughter of Aaron Wilbur and Mary Church. Edith Wilbur married Daniel Cole, son of Ebenezer Cole and Elizabeth Wheeler, in 1783. John served as a lieutenant under Capt. Silas Wild, 1777, and 1778 served in the Guards. John Holbrook was born in 1730 at Scituate, MA. He was the son of Deacon John Holbrook and Sarah Hunt. John Holbrook died in 1815 at New Fane, VT.
[S104] DAR DAR Lineage book, Vol. 31:Pg 259/Item 30748. Ebenezer was a private in Capt. John Couch's company, Wadsworth's brigade of Connecticut militia. Ebenezer Cole was born in 1732 at Duxbury, MA. He married Elizabeth Wheeler, daughter of Timothy Wheeler and Abigail Munroe, in 1751. Ebenezer Cole died in 1789 at Plainfield, CT.
Elizabeth Wheeler was the daughter of Timothy Wheeler and Abigail Munroe. Elizabeth Wheeler married Ebenezer Cole in 1751. Timothy Wheeler was born in 1696. He died in 1782. Aaron Wilbur married Mary Church, daughter of Thomas Church and Edith Woodman, in 1748. Mary Church was the daughter of Thomas Church and Edith Woodman. Mary Church married Aaron Wilbur in 1748. Amos Loveland was the son of Thomas Loveland and Hannah Norkutt.